Until I made these, I had never tasted an elusive popover. Sure, they looked golden and puffy and crispy and flakey and delicious and enough to make me go up a jean size, but . . . I’m just not a bread person. Then, I stumbled across the tiny roquefort popovers in my Williams Sonoma cookbook. I’d like to live in that cookbook. I’d also like to live in the Williams Sonoma catalog. Please and thank you. If you’ve been reading along, you know I am a complete sucker for gorgonzola. I would bathe in it if I could. But, I know that many people don’t like gorgonzola. While I’m insistant that those of you may come from outer space, I can understand how eating moldy cheese may not be. . . appetizing. 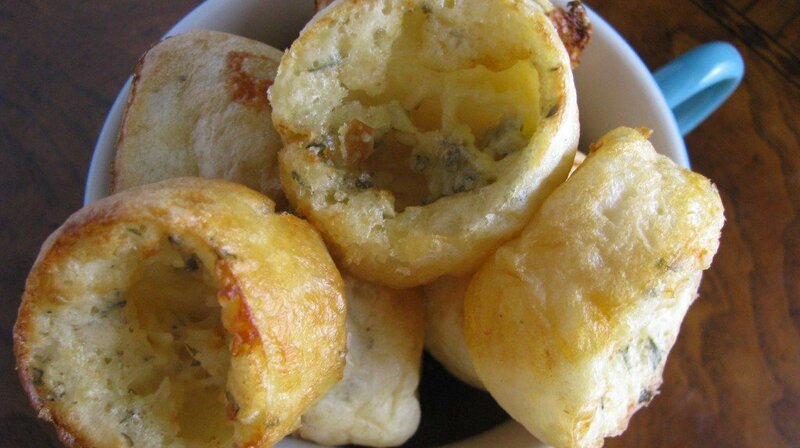 So with that, I’m happy to let you know that these popovers would be incredible with any kind of cheese. In particular, I am thinking of smoked cheddar, asiago, gruyere, havarti . . . you know, just a few of my closest friends. I believe there is such thing as a popover pan, but I used mini muffin tins and they worked prefectly. I’d like to get a popover pan, but I think buying one more kitchen item may result in divorce. Or, at least a temporary separation until Mr. How Sweet becomes emaciated from starving to death. Honestly, that separation would probably last 16 minutes. I can’t wait to make these again. I think they are a perfect treat for a dinner party. I love how tiny they are. I have not attempted them with whole wheat flour yet, but if anyone has, how do they turn out? Position and oven rack in the lower third of the oven. Preheat to 450. Spray mini muffin tins with cooking spray or brush with oil. In a large bowl, whisk together dry ingredients. In a large measuring cup, mix milk, eggs, and butter, and stir into dry ingredients until just combined. A few lumps may remain. Pour batter into tins within 1/4 inch of the rim. Place a teaspoon of gorgonzola in in the center of the batter. Bake for 10 minutes. Do not open the oven. After 10 minutes, reduce the heat to 350 and bake until golden brown and puffed – about 8-10 minutes. Remove from oven and let cool. Serve immediately. Are you a bread person? I’m an everything person. Well, an everything-but-veggies person. I’d most classify myself as a cheese person. And a bacon person. Mr. How Sweet is definitely a meat person. And a stinky person. Peanut Butter Banana Bread Muffins. haha, yeah, Nick is a stinky person when he gets home from work. I can’t even get close to him! I’ve made pop-overs before, but it was in my food science class. If I remember correctly I failed, miserably. They do taste fantastic, and with gorgonzola (one of my favorites!) I bet they taste amazing! And i totally agree that going out to eat is not only $$ , it’s disappointing b/c we can make it better ourselves, just the way we want it exactly, at home! Your popovers looks like they would completely melt in your mouth! So amazingly delicate but I bet they tasted scrumptious! I don’t think I’ve had a popover either. These look like a fabulous one to start with! Whoa – those look yummy! I’m definitely a bread person. Glad to hear that you think they’d go well with havarti! I am most definitely a bread person. But I have to stay away from it or I’ll blow up like a balloon. I am also quite a cheesey person…but you probably know that by now! Those look delicious! I’ve only ever made plain popovers, which I love making because they are so easy and so cute :-) I’ve always used whole wheat flour and they come out great! I have a popover tin which is nice because it just makes them taller, the way they are supposed to be shaped, but I used a mufffin tin to make them many times. I’ve never made popovers. I’m a bread person if it looks like this. Otherwise, I can pass. These look dangerously good. I’m not even a big cheese fan but these I may have to try. I don’t think I have ever even HEARD of popovers until right now. My oh my, you educate me every day. Sorry I can’t return the favor. I think you know just as much about SATC and my best friends Chase Visa and Captain Morgan as I do. I’m all over those popovers like cellulite at the County Fair. Yes, those look amazing and the blue/green tinge fools my brain into thinking there are vegetables in there. I think we should create a Gorgonzola body butter. I love popovers! I’ve done them with half whole wheat pastry flour, but not 100%. Half and half with the AP, you can’t really tell the difference. You may just have to add a bit more liquid as the WW flour is “thirstier”. I made these last night since we were having company and I have wanted to try a popover recipe. I substituted the Gorgonzola with a big pinch of freshly grated Chipotle Gouda since Gouda is my husband’s favorite cheese. It turned out delish! I will be making these again and may have to try another cheese as well. Can these be made in regular muffin/cupcake tins (rather than the mini muffin tins) and be more like standard sized dinner rolls? Or would that ruin the whole effect? I think they can – I’ve never tried but I don’t see why not!